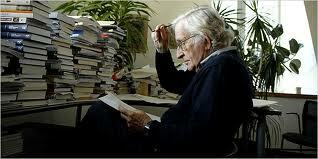 Noam Chomsky, professor of Linguistics and Philosophy at the Massachusetts Institute of Technology, explores the relationship between language, mind, and the brain. The modern cognitive sciences, linguistics included, face problems much like those of chemistry from the collapse of the mechanical philosophy until the 1930’s, when the bodies of doctrine that chemists had developed were unified with a radically revised physics. Contemporary neuroscience commonly puts forth, as its guiding idea, the thesis that “Things mental, indeed minds, are emergent properties of brains,” while recognizing that “these emergences are not regarded as irreducible but are produced by principles that control the interactions between lower-level events—principles we do not yet understand” (Vernon Mountcastle). The thesis is often presented as an “astonishing hypothesis,” “the bold assertion that mental phenomena are entirely natural and caused by the neurophysiological activities of the brain,” a “radical new idea” in the philosophy of mind … . These are not, however, the proper ways to look at the matter. The thesis is old, not new; it closely paraphrases Priestly and others, two centuries ago. It is, furthermore, a virtual corollary of the collapse of mind-body dualism as Newton undermined the concept of matter, in any intelligible sense, and left science with the problems of constructing “bodies of doctrine” in various domains of inquiry, and seeking unification. For the present, the study of language and other higher human mental faculties is proceeding much as chemistry did, seeking to “establish a rich body of doctrine,” with an eye to eventual unification, but without any clear idea of how this might take place. Some of the bodies of doctrine that are under investigation are rather surprising in their implications. Thus, it now seems possible to take seriously an idea that a few years ago would have seemed outlandish; that the language organ of the brain approaches a kind of optimal design. For simple organic systems, conclusions of this sort seem very reasonable, and even partially understood. If a very recent emergent organ that is central to human existence … does approach optimal design, that would suggest that, in some unknown way, it may be the result of the functioning of physical and chemical laws for a brain that has reached a certain level of complexity. And further questions arise for general evolution that are by no means novel, but that have been somewhat at the margins of inquiry until fairly recently. … [T]he conception of the perfection of nature remains a vital component of contemporary inquiry into organic nature, at least in its simpler aspects: the poly-hedral shells of viruses, cell-division into spheres, the appearance of the Fibonacci series in many phenomena of nature, and other aspects of the biological world. How far this goes is a matter of speculation and debate. Very recently, these issues have come to the fore in the study of language. It has become possible to pose in a productive way the questions of “perfection of language”: specifically, to ask how closely human language approaches an optimal solution to design conditions that the system must meet to be usable at all. To the extent that the question receives a positive answer, we will have found that nature has—in Galileo’s words—“employed the least elaborate, the simplest and easiest of means,” but in a domain where this would hardly be expected: a very recent and apparently isolated product of evolution, a central component of the most complex organic object known, a component that is surely at the core of our mental nature, cultural achievement, and curious history.